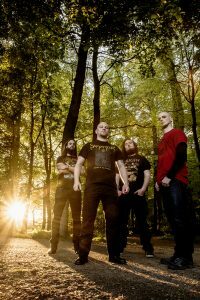 On a quest to combine this passion for death metal with his favoured instrument he teamed up with Nico Veroeven (Serial Butcher) on drums, Guy Van Campenhout (Notti Del Terrore, Angeli di Pietra) on guitar and Kurt Hermans (Herfst, Angeli di Pietra) on bass. Each of whom brings considerable experience in various metalbands. Peter (40) has previously performed, recorded and toured with Thelema Trio (7 tours USA, 2 tours Peru, concerts in Norway, Japan, Italy, Belgium & the Netherlands), The Rhythm Junks (tours in China, Poland, concerts in Belgium and the Netherlands), Champ d’Action (concerts in Germany, the Netherlands, France and Belgium), FUNDAMENT, BLAFFF, and many others. This includes performances at Dour festival, ISCM festival North-Carolina, Centro Cultural de Espagna in Lima, World Clarinet Fest in Tokyo, and many others. Guy (39) started out life as a drummer, before discovering the guitar at the ripe age of 18. But then, all bets were off. Quickly growing in skills on a diet of Iced Earth, Death and rapid, technical bands, he honed his rhythm skills. Later on he went on to be the main vocalist/grunter of powerfolkband Angeli di Pietra, recording two full albums. But guitar needed to be played and he joined industrial metal powerhouse Notti del Terrore as lead guitarist and extreme vocalist. There, he recorded the mini ‘3-TR-DYI’ and two full length albums: ‘Maximum Destruction’ and ‘Havoc’ before Notti del Terrore disbanded. He has also done live session work with several other bands and now his focus solely lies with Wound Collector. Kurt (37) has previously recorded and performed with female fronted folk metal band Angeli di Pietra and blackened death metal band Herfst, including some smaller European tours (Germany, Czech REpublic) and some larger festivals (i.e. Metaldays in Slovenia, Metal Frenzy in Germany).